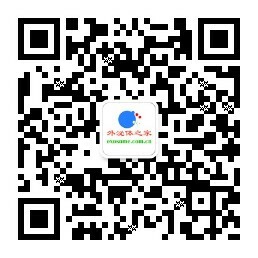 Cell同期发表多篇外泌体与细胞外RNA文章 - 核酸成分（miRNA等） - 外泌体之家 | 细胞外膜泡领域核心平台—exosomes & microvesicles—小膜泡大作用 - Powered by Discuz! 1. 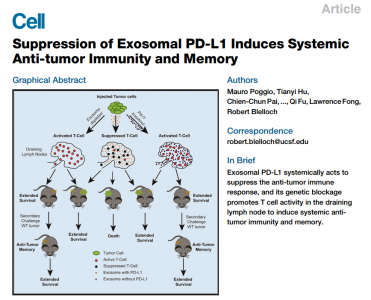 Poggio M, Hu T, Pai CC, Chu B, Belair CD, Chang A, Montabana E, Lang UE, Fu Q, Fong L, Blelloch R. Suppression of Exosomal PD-L1 Induces Systemic Anti-tumor Immunity and Memory. Cell. 2019 Apr 4;177(2):414-427.e13. doi: 10.1016/j.cell.2019.02.016. 2. Jeppesen DK, Fenix AM, Franklin JL, Higginbotham JN, Zhang Q, Zimmerman LJ, Liebler DC, Ping J, Liu Q, Evans R, Fissell WH, Patton JG, Rome LH, Burnette DT, Coffey RJ. 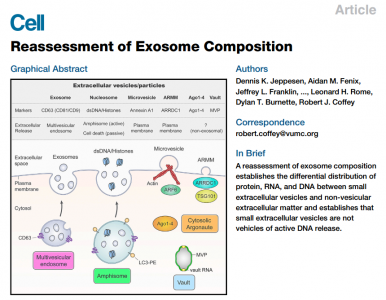 Reassessment of Exosome Composition. Cell. 2019 Apr 4;177(2):428-445.e18. doi: 10.1016/j.cell.2019.02.029. 3. Pluchino S, Smith JA. Explicating Exosomes: Reclassifying the Rising Stars of Intercellular Communication. Cell. 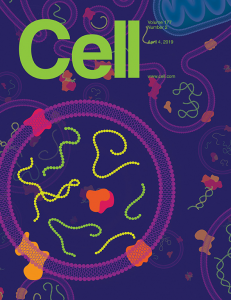 2019 Apr 4;177(2):225-227. doi: 10.1016/j.cell.2019.03.020. 4. Murillo OD, Thistlethwaite W, Rozowsky J, Subramanian SL, Lucero R, Shah N, Jackson AR, Srinivasan S, Chung A, Laurent CD, Kitchen RR, Galeev T, Warrell J, Diao JA, Welsh JA, Hanspers K, Riutta A, Burgstaller-Muehlbacher S, Shah RV, Yeri A, Jenkins LM, Ahsen ME, Cordon-Cardo C, Dogra N, Gifford SM, Smith JT, Stolovitzky G, Tewari AK, Wunsch BH, Yadav KK, Danielson KM, Filant J, Moeller C, Nejad P, Paul A, Simonson B, Wong DK, Zhang X, Balaj L, Gandhi R, Sood AK, Alexander RP, Wang L, Wu C, Wong DTW, Galas DJ, Van Keuren-Jensen K, Patel T, Jones JC, Das S, Cheung KH, Pico AR, Su AI, Raffai RL, Laurent LC, Roth ME, Gerstein MB, Milosavljevic A. exRNA Atlas Analysis Reveals Distinct Extracellular RNA Cargo Types and Their Carriers Present across Human Biofluids. Cell. 2019 Apr 4;177(2):463-477.e15. doi: 10.1016/j.cell.2019.02.018. 5. Srinivasan S, Yeri A, Cheah PS, Chung A, Danielson K, De Hoff P, Filant J, Laurent CD, Laurent LD, Magee R, Moeller C, Murthy VL, Nejad P, Paul A, Rigoutsos I, Rodosthenous R, Shah RV, Simonson B, To C1, Wong D, Yan IK, Zhang X, Balaj L, Breakefield XO, Daaboul G, Gandhi R, Lapidus J, Londin E, Patel T, Raffai RL, Sood AK, Alexander RP, Das S, Laurent LC. 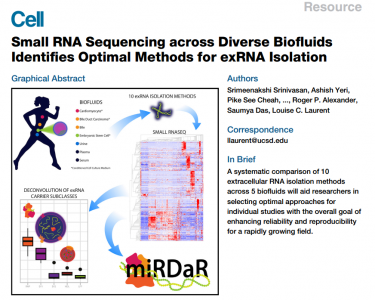 Small RNA Sequencing across Diverse Biofluids Identifies Optimal Methods for exRNA Isolation. Cell. 2019 Apr 4;177(2):446-462.e16. doi: 10.1016/j.cell.2019.03.024. 6. 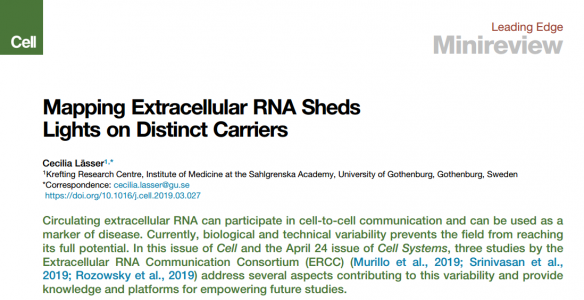 Das S; Extracellular RNA Communication Consortium, Ansel KM, Bitzer M, Breakefield XO, Charest A, Galas DJ, Gerstein MB, Gupta M, Milosavljevic A, McManus MT, Patel T, Raffai RL, Rozowsky J, Roth ME, Saugstad JA, Van Keuren-Jensen K, Weaver AM, Laurent LC. The Extracellular RNA Communication Consortium: Establishing Foundational Knowledge and Technologies for Extracellular RNA Research. Cell. 2019 Apr 4;177(2):231-242. doi: 10.1016/j.cell.2019.03.023. Review. 7. 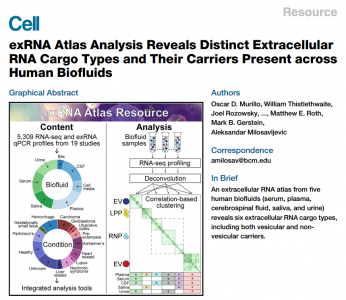 Lässer C. Mapping Extracellular RNA Sheds Lights on Distinct Carriers. Cell. 2019 Apr 4;177(2):228-230. doi: 10.1016/j.cell.2019.03.027. GMT+8, 2019-4-23 23:52 , Processed in 0.259977 second(s), 28 queries .